When the cold and flu season is in full swing, here is a review some of the more important essential oils and how we can use them to combat those winter bugs! My first advice is to keep your environment clean and free of germs. This can be easily done by burning an essential oil in an aroma lamp. 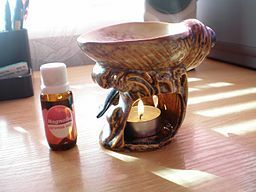 An aroma lamp is usually a small bowl filled with water and 5-8 drops of essential oil, which sits over a tea candle. The heat from the candle evaporates the water and tiny molecules of essential oil become suspended in the water vapors, which then fill the room. By inhaling the mist, you ingest the essential oil into the nasal passages, which then kills off germs in the nasal cavity, trachea, bronchial tubes etc. The essential oil vapors are also able to destroy germs floating through the air, say from a sneeze for instance. So by humidifying the room using essential oils, you can alleviate the introduction of most germs. The best essential oils for an aroma lamp are: Lavender, Eucalyptus, Camphor, Cajuput, Rosemary, Pine and Sage. Essential oil can also be added to a spray bottle full of water and misted in the area, especially around doorknobs and other multi-use surfaces, or likewise you can put essential oils in a solution with water and wipe the surfaces with a cloth. Any of these methods will keep germs at bay. Please note that if you are on homeopathic remedies, the stronger menthol oils will antidote the remedy, in which case it is best to stick with lavender. Although, lavender is a sedative oil and may not be the best choice for an office area since it will make you sleepy and unfocused. Lavender is best for the bedroom area, whereas rosemary, pine and eucalyptus are better for cleansing work places. If the germs have already invaded the body and you are at the sore throat stage, then the best method for using essential oils is in a gargle. I know I have said many times that essential oils should not be taken internally, but with gargling, you expectorate most of the solution, so it is considered safe. In half a glass of warm water, place only one or two drops of the essential oil, and gargle as normal. The best oils to use in a gargle are tea tree, sage, eucalyptus, garlic and ginger. If you have reached the achy joints and sore muscles stage, then the best way to apply essential oils is through massage. Up to 6 drops of oil in a carrier oil can be rubbed onto the sore, achy places and then covered with a heating pad or warmed towels. The best oils for *massaging stiff sore areas are tea tree, eucalyptus, ginger, black pepper, rosemary, cypress and lavender*. And lastly, if the cold has progressed to the congested, mucousy stage, then massaging the oils onto the chest and burning them by the bedside in an aroma lamp will help break up the catarrh. Some recommended oils for *congestion are sandalwood, eucalyptus, cedarwood, peppermint, rosemary, frankincense and hyssop*. Another very useful method is the old head over a bowl method. Fill a bowl with hot water and put a few drops of essential oil into the bowl. Place a towel over your head and lean over the bowl, breathing the vapors in deeply. It is amazing how quickly you can clear up congestion with this method. So this cold and flu season, don’t let those germs get you down. You can now combat them on many different levels with the help of essential oils!